Yesterday, Acer announced its new budget (mid-tier) smartphone dubbed the “Liquid Zest Plus” at their event in New York City. It was one of the few things they announced, and to be honest, it really caught my attention. Acer isn’t really known to be a “smartphone company”, but they’ve pretty much nailed the concept of budget phones as it includes some great features! This budget phone might be a phablet for some people as it sports a 5.5-inch screen. The specifications will not blow your mind away, but they are pretty decent for the $250 price tag that this device holds. Those specifications/details mentioned above are pretty good for a $250 phone, I’ll have to admit! The 13MP rear camera includes a technology Acer calls tri-focus, which means that the camera will rely on the latest means of AutoFocus (laser, contrast detection and phase detection) in capturing a photo. There’s another reason that proves why this phone is gaining popularity, and that’s the battery. 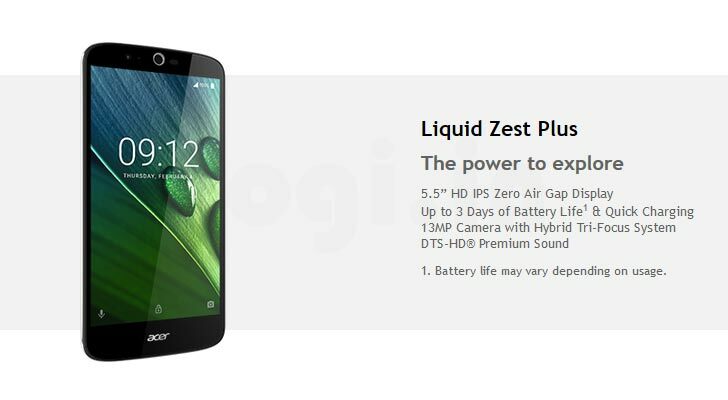 The Zest Plus features a whopping 5,000 mAh battery that is always ready for quick charging! That battery will definitely get you through hours of video watching, games, and social media. This is the phone to look forward to if you are on a budget and want the best battery life in a phone! Are you looking to pick up the Liquid Zest Plus when it’s released? Next article Is it a Risk to Order the Tesla Model 3?